Where's My Glow? : Onesie: Woesie or Winsie? It is no secret that I am staunchly anti-onesie. In fact earlier this month after seeing no less than six different people in my feed in twenty minutes bang on about onesies and cat ears I may have snapped. And if one more person in my feed extols the virtues of onesies or cat ears for adults I'm pretty sure I'll burst a blood vessel. I would go so far as to propose laws that prohibit adults from wearing clothes designed for infants. It is entirely too creepy for me in the same way as an adult rocking up to a party wearing only a nappy, just because some people on Twitter said they were “in”, would. Every second person tells me they are so comfortable, that I'm missing out. They say that about CROCS too, people! I will not be fooled! Now, I’m no fashionista, and I most certainly have committed many a fashion crime in my day (hello fluoro overalls over hypercolour t-shirt circa 1992). I’ve also been known to completely eat my own words before – I went from being against wearing skinny jeans for fear I’d look like a whale to being a devotee because OMG MY ANKLES LOOK AMAZING. Did I really just say that? Kill me. So is there something that could get me to wear a onesie? Maybe for charity? Or to win a prize? I once sang a retail store jingle in the middle of a crowded movie theatre to win a vacuum cleaner, so it is pretty obvious I’m willing to stoop to a somewhat low level to win something cool. Winning $250 to spend at IGA would totally count as something cool. I would buy $250 of Brie and Camembert cheese and have it on standby. Now I don’t know if I could bring myself to wear a onesie but I could go and stick my head through a cardboard cutout that made it look like I was wearing one which is what the folk at IGA are asking. So technically no fashion crime would occur. HUZZAH for loopholes! I'm totally gonna do it. 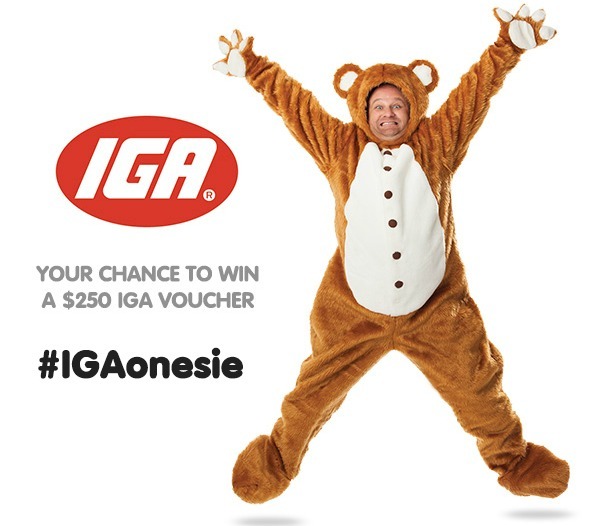 Perth Peeps, head down to your local IGA, find the onesie and have your photo taken with it and upload it to either Facebook, Instagram or Twitter using #IGAonesie. If you wear a onesie while you do it, you may create an infinite loop, so BE CAREFUL! You may also make me roll my eyes... or if you look awesome, I may just eat my own words. Again. Skinny jean onesie, anyone? Are you for or against the onesie?